Custom Keyboard Spotlight: Hands-on with the Input Club Kira - Dr Wong - Emporium of Tings. Web Magazine. Several months back, we talked about the launch of the Input Club Kira. It was only available for pre-order at the time, but now the keyboard exists. You can order a Kira from Input Club’s Kono store. And you know what? You might want to do that. 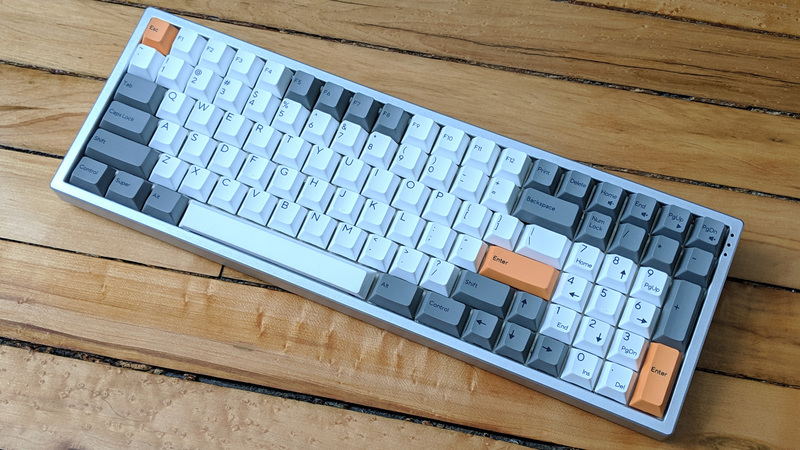 I’ve been using this keyboard, and even the “base model” is a fantastic device and a great way to get into custom keyboards. The Kira is a condensed full-sized keyboard, so it has almost all the keys you’d get on a traditional 104-key layout (99 of them). It’s not as wide as a regular keyboard because the number pad and arrows are right next to the right-side modifiers. This design saves a ton of space and makes reaching for the number pad less arduous. This keyboard does support function layers and full programmability, but it’s rare you’ll need to get in there beyond fiddling with the LEDs. Yes, there are LEDs under every single switch. They shine through brightly as long as you’re using a switch with a transparent housing or a light pipe. Many of the switch options on the Kono Store are transparent, but this is a hot-swappable board. If you want to try other switches, just pluck out the old switches and plug in new ones. In addition to using the Kira keyboard in real life, I’ve been able to try out the new Input Club desktop configurator. This app lets you create layouts, modify layers, and customize the LED colors in a visual interface. This is by far the easiest keyboard programming experience I’ve had. It also has a USB Type-C connector, which is ideal for future use. 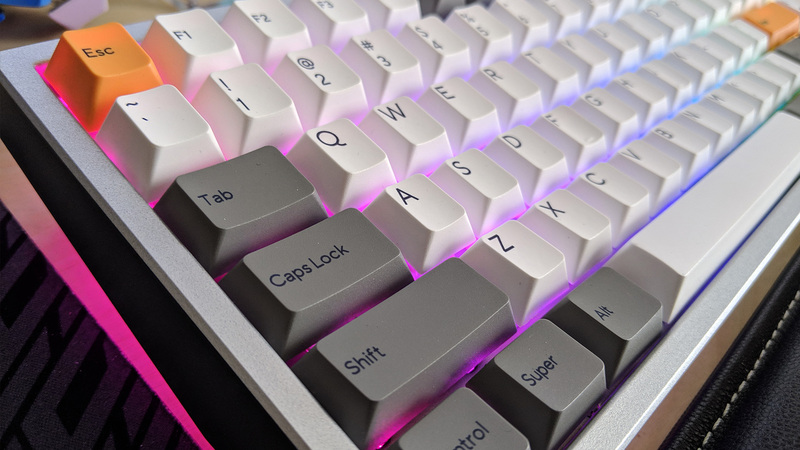 You also get a full keycap set with the Kira with several different accent color options. They’re PBT plastic with dye-sublimated legends. So, the colors are impregnated in the plastic and won’t wear off. PBT is also harder than ABS and won’t show wear as quickly. The walls aren’t as thick as some custom keysets I’ve used, but it’s incredibly impressive for an included set for the price. 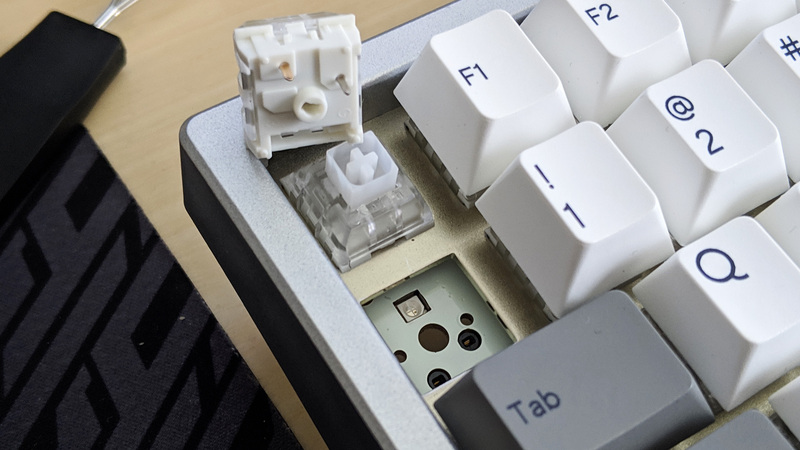 The Kira keyboard starts at $179, which is extremely cheap for a board with these capabilities. The only real drawback at that level is the plastic case. It’s solid silver on the top with a translucent bottom that allows the LED underlighting to shine through. As far as plastic cases go, it looks and feels nice. The keyboard itself is also very lightweight, if you’re into that. I’m more a fan of heavy metal boards, and there’s an aluminum case version of the Kira available for $259. Again, cheaper than most competing keyboards. The Kira is absolutely worth the price in either configuration.